C. F. Martin 000-28 Shaded Top Model Flat Top Acoustic Guitar (1948), made in Nazareth, PA, serial # 104842, sunburst top, natural back and sides finish, Brazilian rosewood back and sides, spruce top; mahogany neck with ebony fingerboard, original black hard shell case. Here is a superb and rare delight in an original vintage Martin -- a well-preserved 000-28 from 1948, with the additional unusual feature of a sunburst "shaded top," which was a seldom seen option of the period. While always a well-respected instrument, the Brazilian rosewood 000-28 from this era is actually a relatively rare guitar. Only 144 000-28s were sold in 1948, the first full production year after the herringbone trim was deleted from the top edge. A total of 506 D-28s were shipped out that same year, making that Dreadnought model more than three times as common as the rosewood 000! 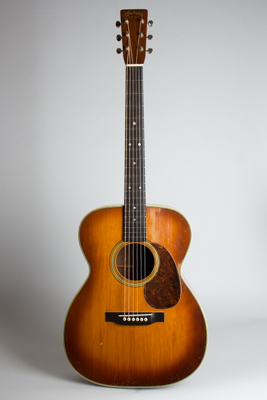 At a list price of $140 in 1948, the 000-28 was a fairly expensive guitar; in fact, only $20 less than the D-28. As a result, in this period the 000s seemed to fall "between the cracks," selling less than either the inexpensive student Martins or the Dreadnoughts that were becoming the norm for the "Hillbilly" radio entertainers of the day. The features of this just-post-war 000 have moved on a bit from the classic pre-war appointments but still combine to make a most attractive guitar. The white/black/white celluloid binding around the top is 5-ply with a thick outer layer; the previously used herringbone top trim had been discontinued the year before. The back remains triple-bound with a chain pattern backstrip and celluloid heelcap. Other features include the graduated size dot inlay in the ebony fingerboard (introduced in 1944, replacing the earlier small split diamonds), a long-saddle ebony bridge, and a tortoise celluloid pickguard. The individual tuners are the very earliest Kluson Deluxe style with metal buttons, with the short-lived characteristic of the gear shaft not being anchored on the far side. These would have been a brand-new design in 1948, just introduced around the time this guitar was made. The Brazilian rosewood on the back and sides has nicely straight and even figuring as Martin preferred, with a few small anomalies to give it some character. The top is of a very even narrow grained spruce, with a subtly graduated brown-to-amber sunburst with a lovely aged patina. The sunburst or "shaded" top (as Martin called it) was a little-used finish option at the time, and one was only produced if a dealer or customer specifically ordered it. It is unlikely that more than a handful of any given model were finished this way in any particular year. All this makes for a beautiful guitar to look at, but as with most Martins the real joy comes in the playing. This 000-28 responds extremely well to both a light and heavier-handed strumming approach, and has a brighter, more cutting tone than some rosewood 000s we have had, while maintaining plenty of depth. It makes a wonderful "cowboy" rhythm guitar as intended, but is also quite responsive and makes a superb fingerpicker as well. The 000-28 in general is one of our favorite Martin models, and this rare "shade top" is one of the sweetest examples we have seen in a while. Overall length is 39 3/4 in. (101 cm. ), 15 1/8 in. (38.4 cm.) wide at lower bout, and 4 1/8 in. (10.5 cm.) in depth at side, taken at the end block. Scale length is 24 3/4 in. (629 mm.). Width of nut is 1 11/16 in. (43 mm.). This guitar shows some play wear overall but remains in lovely original condition. The most notable worn area is to the top below the fingerboard, where there is some old strumwear likely dating to the guitar's Cowboy Rhythm days. There is also a fairly deep wear spot into the wood just at the treble side waist, in the niche between the lower edge of the pickguard and the binding. The rest of the top shows some scuffs and a few deep divots, but little other pickwear. There is a decent amount of checking to the finish, mostly on the top. The original ebony bridge shows signs of having been reglued -- possibly more than once -- and lowered just slightly on the front edge long ago. There are some scars to the bridge top from string removal, but nothing severe. The bridgeplate and bracing are quite clean and original, with what looks like a spot or two of careful re-gluing here and there. The back, sides, and neck have some light wear but nothing too serious -- this has been a well-cared for guitar. The finish shows no overspray or work except for some tiny color fill-ins in a couple of deep dings; amazingly, there are no crack repairs. The fingerboard has been very nicely refretted and the guitar plays extremely well. This is a spectacular "shade-top," a truly wonderful old Martin with a unique look and a great sound, complete in its original green-lined HSC. Excellent - Condition.